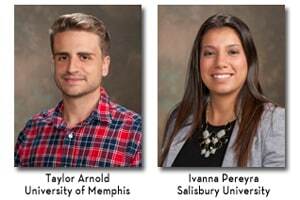 The National Farm Medicine Center hosted two students as part of a national summer internship program providing practical experience in the field of occupational safety. Ivanna Pereyra, Salisbury University, and Taylor Arnold, University of Memphis, spent eight weeks in Marshfield, Wis., working primarily on Seguridad en las Lecherias, a project that is testing culturally appropriate occupational safety and health training for immigrant dairy workers. Pereyra and Arnold came to the Farm Center as part of the Occupational Health Internship Program (OHIP), an initiative of the Association of Occupational and Environmental Clinics http://aoec.org/ohip/. Competition for internships was keen with just 34 positions nationwide for more than 400 applicants.